Not sure why, but my local Dollar Tree has been stocking a lot of Nature Valley products lately. 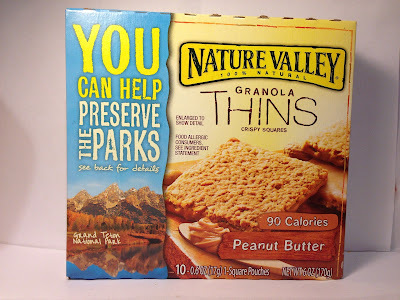 I've already reviewed one of those products that I picked up there but since they had multiple variations, I picked up a box of these Nature Valley Peanut Butter Granola Thins Crispy Squares for $1.00, naturally. Obviously these are not $1.00 in the "wild" of the grocery store, so I would anticipate that you could grab these in the $3.00 range typically. Each box contains 10 individually wrapped squares and each square is 0.6 ounces has 90 calories with a one lone gram of protein. Even though this has an exceptionally long product name, it's really a pretty basic product. 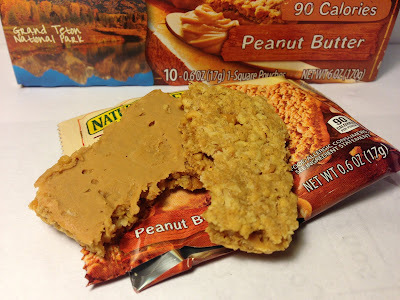 It's a square bar that is exceptionally thing and has a base layer of peanut butter (the left side in the photo above) that is topped by a layer of granola that includes little peanut bits (on the right, obviously). Not only is this thin, but the square is pretty small too as it only measures two inches by two inches. It has a strong peanut butter smell and the granola itself is quite crumbly, as you might expect. Other than that, there's not a whole lot else to this product as it is very basic, as I said. In terms of taste, it's pretty basic too, but that's not a bad thing. The peanut butter is thick, salty and coats your tongue and throat. It lacks sweetness like some peanut butters, but that saltiness mixes well with the airy and crispy granola. The crunch of the granola and the creaminess of the peanut butter work well together as you chew through this and in all actuality, this reminds me of one of those peanut butter cracker concoctions that you could pick up at the gas station as a snack. This fits that bill too as it is a perfect snack as well. Buy It or Fly By It? Basic flavor, basic design, but still a good product that gets a BUY IT rating. It's like old reliable...you basically already know what you are going to get going into this and the fact that Nature Valley delivers on what you already know you are going to get is a good thing and that makes this worth a purchase. My only complaint, albeit small, is that I wish that these bars were bigger because I could probably barrel through the entire box before any of my hunger subsided. Just wanted to give you a heads up, since I recognized the photo.